My hopes and dreams of my football team making the Superbowl this year are officially shot dead. The only shred of a bright spot to last Sunday was the good food we enjoyed. 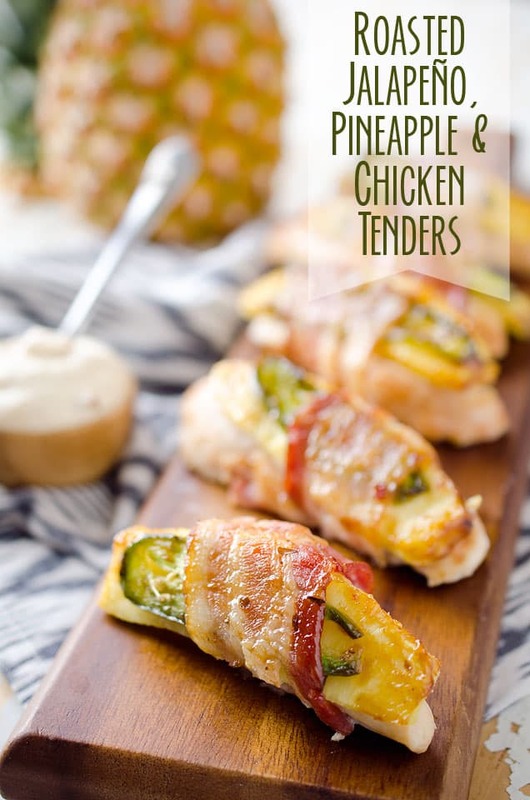 On the menu for game day, were these Pepperoni Chicken Fingers, Baked Bleu Cheese and of course these amazing Baked Southwest Onion Rings! If you follow the Vikings, you know this isn’t he first time we have suffered such a devastating loss in the last minutes of a playoff game before. Gary Anderson. That is all that needs to be said really. I was only 13 years old at the time, but I remember the gut-wrenching missed field goal that lost us the NFC title like it was yesterday. 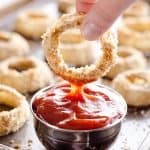 If you are one of the few lucky fans cheering for a team still in the playoffs or you are just a football junkie and watch every game regardless, these Baked Southwest Onion Rings are the perfect addition to your game-day menu. 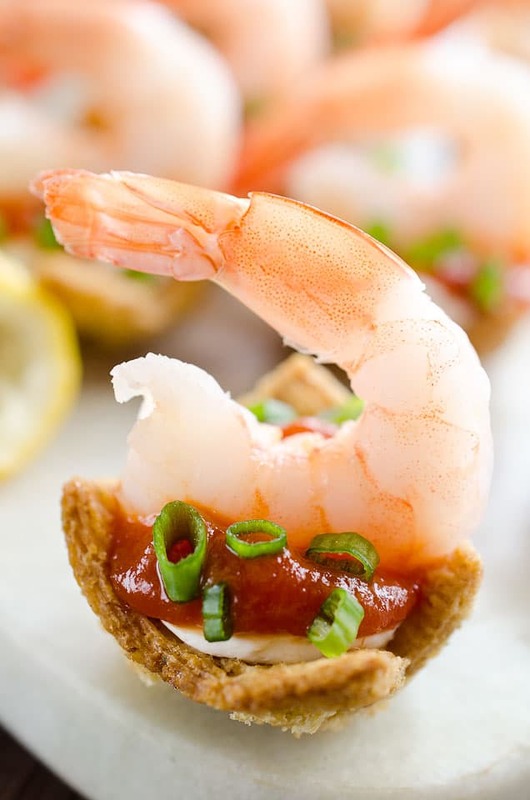 They are lightened up with whole-wheat flour and spiced up with chili powder, garlic and cumin for a delicious and light appetizer everyone will love. A coating of Panko bread crumbs finish them off with a nice and crunchy texture. The Super Bowl will also be enjoyed with great food, friends and hopefully funny commercials and entertaining half-time performances. 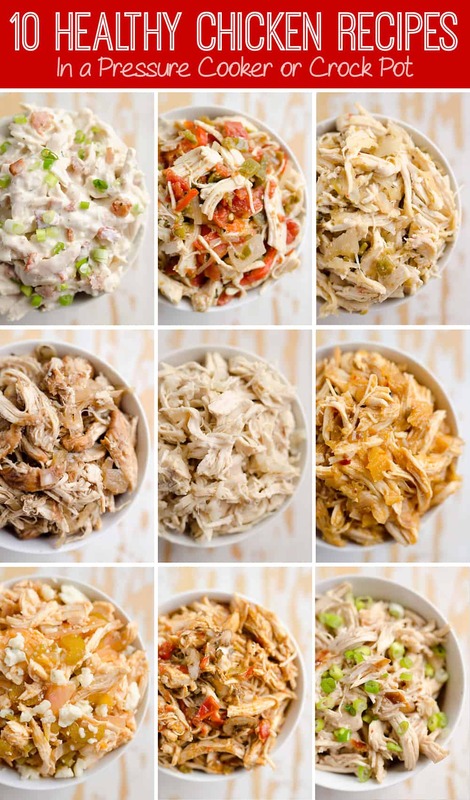 No matter why you are at a Super Bowl party, the food is obviously the star of the show. 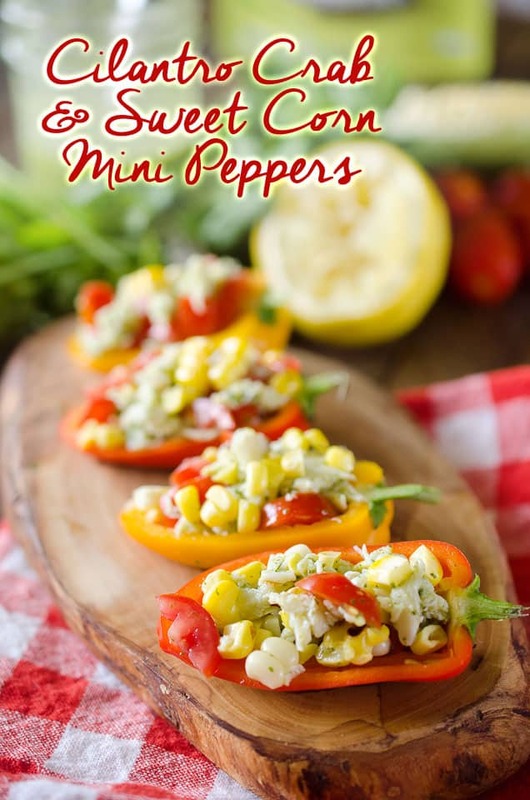 So whip up something delicious and enjoy the game! 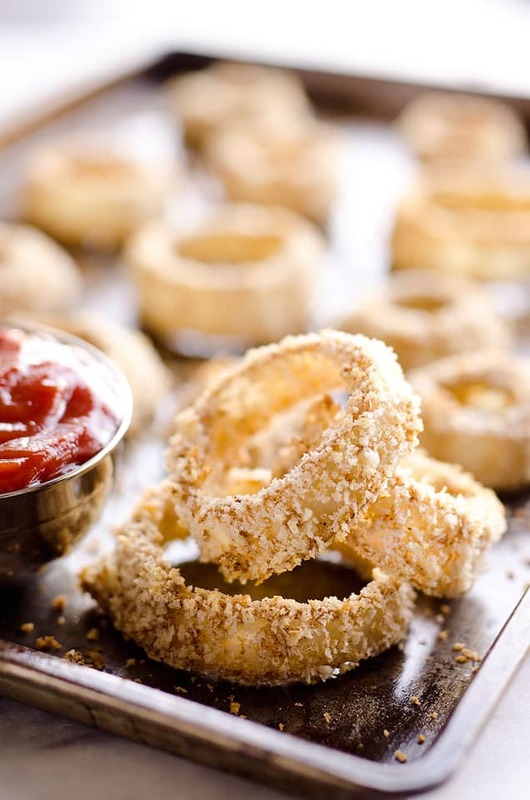 Baked Southwest Onion Rings are a lightened up version of a classic appetizer! 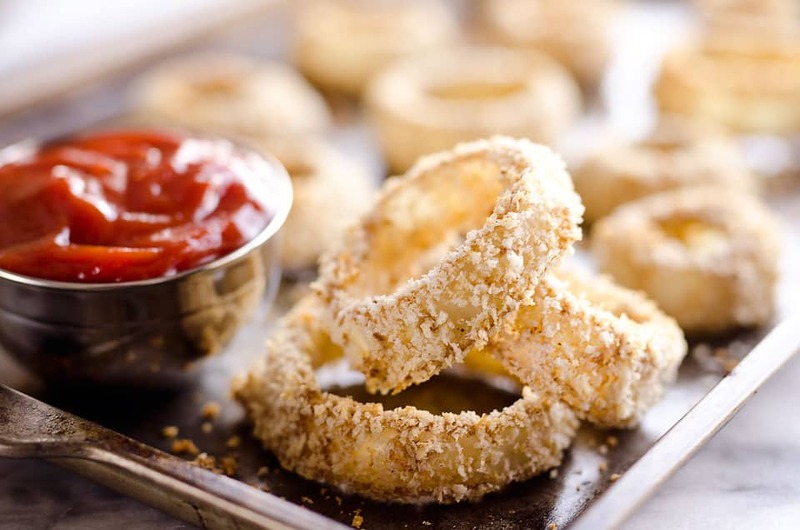 Onions are coated in whole wheat flour, eggs, panko break crumbs and a mix of southwest spices and baked instead of fried for a healthy side dish. Peel the onion and slice into 3/4" thick rings. Separate all of the rings into individual pieces and place them in a bowl of water while your prepare your remaining ingredients. Using three separate bowls, add the flour, 2 tsp. chili powder, 1/2 tsp. garlic powder & 1 tsp cumin to the first bowl. In the second bowl, whisk the egg and water mixture until light and airy. In the last bowl, add the Panko breadcrumbs with the remaining spices and mix until they are well incorporated. 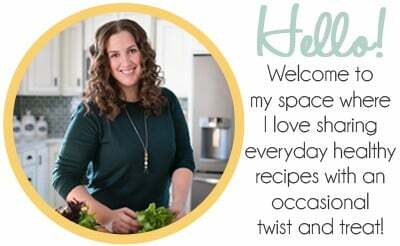 One at a time, take an onion ring from the bowl of water and coat first in the flour, then in the egg and lastly in the Panko break crumbs. 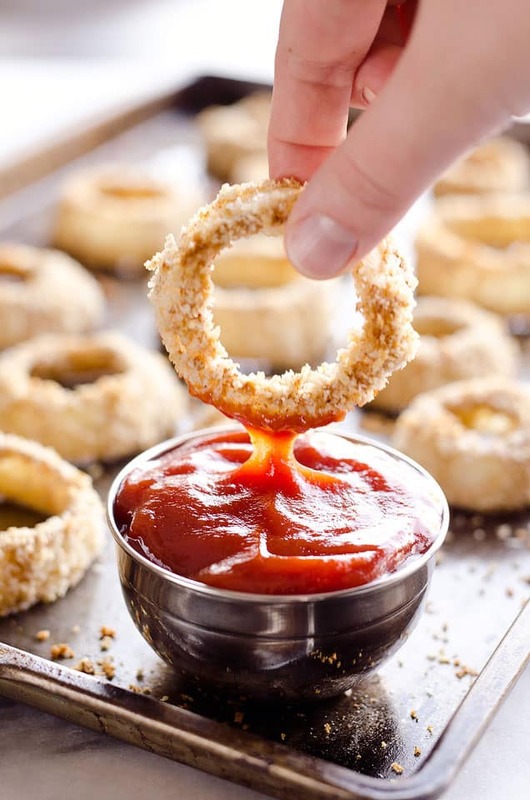 Please the coated onion rings on a baking pan. 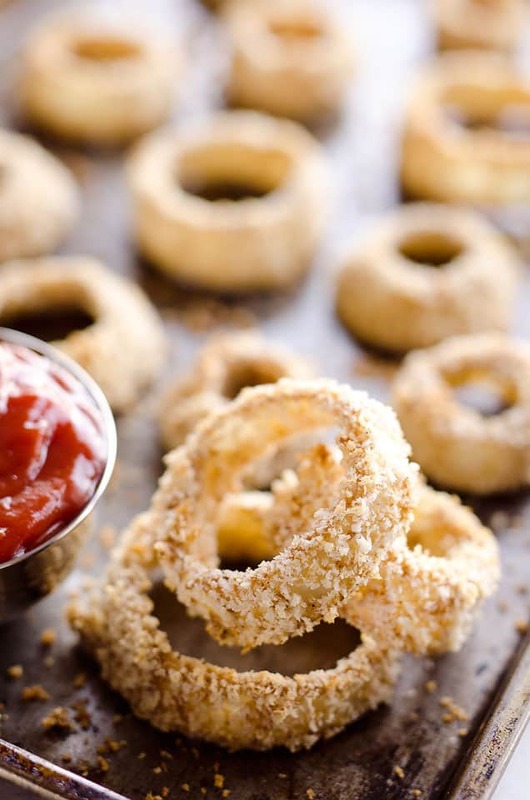 Once all of the onion rings are coated, give them a quick spray of non-stick olive oil spray. Bake at 450° for 20-25 min until crunchy and golden brown. Rotate the onion rings half way through baking. Honestly did you really think they’d win? I mean really Danielle 🙂 These Onion Rings are for sure a win though!